Search and adopt a Welsh Springer Spaniel near you. The Welsh Springer Spaniel is a dog of distinct variety and ancient origin, who derives his name from his hunting style and not his relationship to other breeds. He is compact, obviously built for hard work and endurance. The Welsh Springer Spaniel is an active dog, loyal and with an affectionate disposition. Reserved with strangers, not timid, shy or unfriendly and is a devoted family member and hunting companion. Slightly smaller than the English Springer, the Welsh Springer is solid and compact, possessing a rich dark red and white coat which is thick and silky and is very nearly self-cleaning. Bred specifically to spring game toward a net or into the air for a falcon to capture. With a superb nose, slightly webbed feet and an ability to negotiate heavy ground cover the Welsh Springer is not only a versatile hunter but is also a very good water dog and retriever. The Welsh Springer does possess a stubborn streak. 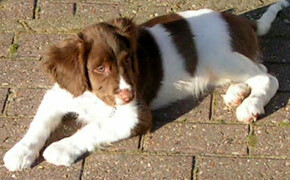 The Welsh Springer is an extremely intelligent dog and can be an excellent hunting companion. Being of medium build and size with an even, reserved, disposition the Welsh Springer is a gentle family dog and prefers to be with his people. The Welsh Springer is often referred to as a 'Velcro' dog as you cannot go anywhere without them. At the same time, without being mean or aggressive, the Welsh Springer knows when to protect and guard. The average life span of the Welsh Springer is 12 to 15 years of age. Average height is 17 to 18 inches for a female and 18 to 19 inches for a male. Average weight is 35 to 50 pounds for a female and 40 to 55 pounds for a male.